Toby holds an MFA in ensemble-based physical theater from the Dell’Arte International School of Physical Theater. He has also studied with Commedia dell’Arte Master Antonio Fava and with faculty from the Moscow Art Theater School. 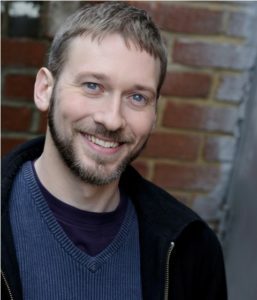 In addition to his work with Traveling Players, Toby is the former Producing Artistic Director of Faction of Fools, Washington DC’s only company dedicated to Commedia dell’Arte and 2012 Helen Hayes Recipient of the John Aniello Award for Outstanding Emerging Theatre Company. With Faction of Fools, he directedThe Miser and The Lady Becomes Him, and performed in the Helen Hayes-nominated Commedia Christmas Carol, as well as the critically-acclaimed Romeo & Juliet, Titus Andronicus, and Hamlecchino: Clown Prince of Denmark. Toby teaches Commedia dell’Arte throughout the DC-metro area and is an adjunct professor at George Washington University. He has directed Commedia-inspired plays at GW and Montgomery College. Local acting credits include Roundhouse, Constellation, and First Stage. His musical duo, Dr. Dour & Peach, has performed at the Capital Fringe Festival, Shenandoah Fringe, ABSFest, DC Clown Cabaret, Cincy Fringe, and the New York Clown Theatre Festival, and released its first studio album, The Monster Songs, in 2016. His play Crawdaddy was performed at the Festival of Animated Objects in Calgary, Canada. Since joining TPE in 2007, Toby has directed Sganarelle, The Miser, The Forced Marriage, A Midsummer Night’s Dream, The Love for Three Oranges, The Blue Monster, The Bourgeois Gentleman, and Scapin. He created the Commedia Troupe in 2009, and has directed its productions of No Room at the Inn, The Fake Madwoman, The Tragic Events, The Picture, The Great War, Cinderella, Snow White, The Frog Prince, and Sleeping Beauty.